Parakeet Bay, a secluded cove, located on the northern side of Rottnest Island, is the big sister of Little Parakeet Bay. 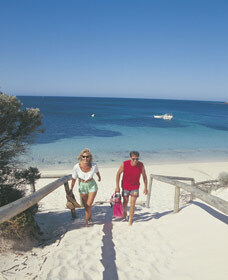 Ideal for swimming, the bay is known as a good, safe place for swimmers as its waters are shallow and well protected. Tranquil and peaceful, this enchanting bay exhibits pristine sandy white shores and crystal clear aqua blue water.